So, this was going to be a french dessert made of peaches, but I'm waiting for a sunnier day to take pictures of that. What we have here right now qualifies for Summer the same way I qualify for a "happy young woman". You know it could be it, but somehow, it never is. But, to hell with that - there has to be some pleasure in this life, otherwise what's the point? This is a genuinely my recipe - I've invented it. Of course, hundreds of people have probably invented it too, because it doesn't take some huge leaps of imagination, but it's good and easy and that's what counts. I call it Penne Primavera, because I like faux-Italian names and alliteration. But it works just as well with tagliatelle, fettuccine or spaghetti. Actually, pretty much every pasta in existence (with the possible exception of orzo and other minute types, because they get lost in the sauce). The only actual difficulty with this recipe is the timing, because the sauce is based on melted cheese so it sets if you take it off the heat. Which means you've got to time it with boiling the pasta so that you have both ready at roughly the same time. 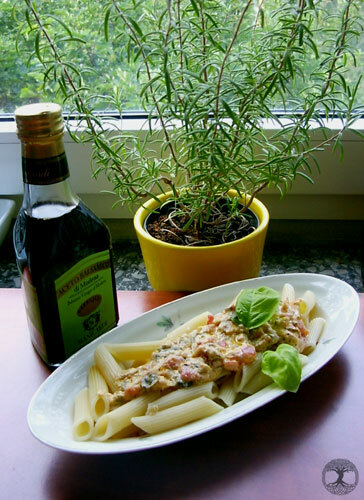 It's generally better to have pasta waiting for the sauce than the other way around, because if you have the sauce ready, you either have to leave it on the stove, in which case it burns or gets too thick and dry, or take it off, in which case it sets and doesn't spread like it should. But it's nothing difficult, really. Oh, and it's probably the only pasta recipe in the world that doesn't really benefit from being sprinkled with grated cheese. No, really - it won't ruin the dish, but it adds... nothing very much. So leave that Parmesan for Aglio e Olio, Primavera doesn't need it. Start with putting on a pot for boiling pasta. Then, chop the whole shallots thinly, down to the last green strand. If you end up with a mountain of greenery, don't worry - it'll shrink in cooking. 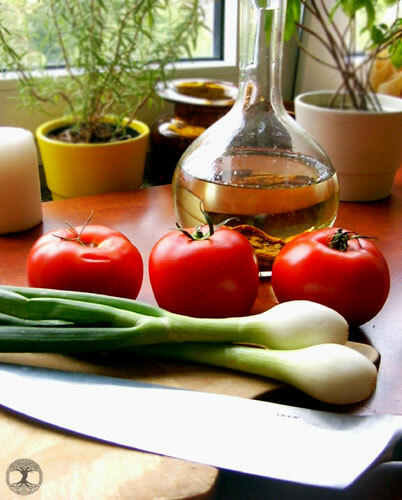 Pour olive oil into a frying pan and fry the shallots on mild heat, stirring from time to time. When they get supple and nicely warm (the colour doesn't change much), slice the cheese into thin slices and put them on the pan. Thin slices mean it'll melt faster, but still you should keep the fire small and cover the pan for a while - that way the cheese will melt and not fry. In the meantime, peel the tomatoes with aid from some boiling water (I usually use the pasta water for that, since it should be boiling now ; if it is, put pasta in) and chop them into small bits - the smaller, the better. 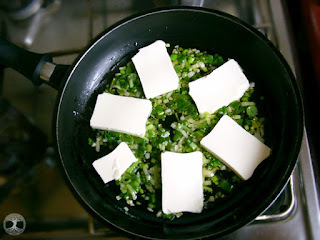 Now check on the cheese - there should be a white-ish, grainy mass with bits of green in the pan. Put in the tomatoes and all the juice that might have spilled during chopping. Mix it all up, add chopped garlic and spices, and cook on mild heat until surplus water evaporates and you're left with a thick, golden mass. It will stick to the spoon, it will stick to the pan, so frequent stirring is in order. Once your pasta is ready, you can pour the sauce over it and serve. This is a dish of distinct flavor, and a colourful, jolly appearance - hence the name. It is also quite full of calories, as pastas generally are, so accompany it with a salad at most, and not a fried-chicken-and-cheddar salad, either. Chilled white wine will suit it very nicely, but so will most pink wines and some lighter types of red. There are no unpleasant odours involved so it's a good dish for an elegant or romantic occasion.